Strike Plus Spray. 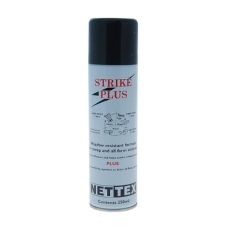 Effectively repels blowfly strike. Each application has a combination of two fly repellents, a biocidal action to clean and disinfect minor wounds, plus easily absorbed oils providing long term repellent action whilst soothing irritation. Leaves a weather resistant film to inhabit further re-infection and encourage rapid healing.